Standing majestically on a perpendicular cliff, 410 feet above the skyline of city, the majestic Mehrangarh Fort is the prime attraction in the city of Jodhpur, the Blue City, in Rajasthan, India. Enclosed by impressive thick walls, the mammoth Mehrangarh Fort was constructed around 1460 by Rao Jodha of Mandore, a Rajput Chief of Rathore Clan, who also founded Jodhpur city. Polished red sandstone, impressive architectural styles, and intricate carvings yet with a strange haunting beauty that beckons tourists and never fails to lure them. Much has been written in the praise of this majestic and mammoth citadel of Jodhpur but actual experienced can be gained only after making a visit to this fort. When you will enter the grand and historical Mehrangarh Fort, you will be amazed to see several architectural beautiful, brilliantly crafted and decorated palaces known for their intricate carvings and expansive courtyards. Most prominent and notable palaces and buildings within the fort complex are Sheesha Mahal (the Mirror Palace), Moti Mahal (the Pearl Palace), the Phool Mahal (the Flower Palace), Daulat Khana, and Sileh Khana. There are several imposing gates by which entry to the fort can be gained. Most famous gates for entry to the fort complex are Jai Pol, Fateh Pol, Dedh Kamgra Pol, and Loha Pol. The Jai Pol was constructed by Maharaja Man Singh in 1806 to celebrate his victories over Jaipur, Udaipur, and Bikaner. The Fateh Pol was built by Maharaja Ajit Singh to celebrate his victory over the Mughals in 1707. Dedh Kamgra Pol is the place where you can still see the marks of bombardment by cannonballs. The Loha Pol is the final gate into the main part of the mammoth Mehrangarh Fort Complex. The sati marks upon gates still attract much attentions. The sati marks are the palm imprints of the queens who in 1843 sacrificed themselves on the funeral pyre of their husband, Maharaja Man Singh. There is also a museum inside the fort complex which is known as the Mehrangarh Fort Museum or Mehrangarh Museum. The fort museum is considered to be one of the most prominent and well-stocked museums in the state of Rajasthan. The Mehrangarh Museum consists of several galleries. Some of prominent and worth-see galleries in the museum complex include Elephant’s Howdahs, Palanquins, Daulat Khana, Armory, Painting Gallery and the Turban Gallery. While exploring the museum complex you will have a wonderful opportunity to see a collection of old royal palanquins, royal cradles, beautiful miniatures, artistic paintings, ancient musical instruments, ancient furniture, royal consumes, and several other artifacts. If you want to see and understand the heritage of the Rathores in costumes, paintings, arms, and decorated period rooms, then you should not miss to explore the museum within the majestic Mehrangarh Fort. The ramparts of the Mehrangarh Fort house the preserved old Kilkila cannon. You can see a breathtaking and panoramic view of the city below from the ramparts of the fort. There are several other structures and tourist attractions within the Mehrangarh Fort. 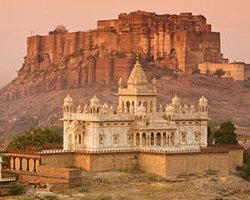 Some other attractions in Mehrangarh include National Geological Monument, Rao Jodha Desert Rock Park and Nagnecha Mataji Temple. You will also see the famous Chamunda Devi Temple or Chamunda Mata Temple, a temple dedicated to Goddess Durga, located at the end of the Mehrangarh Fort. During Dussehra festival, a large number of devotees gather at the Mehrangarh Fort to see the glimpse of the temple. On the whole, visiting the grand and historical Mehrangarh Fort and exploring its attractions like palaces, temples, museum will provide you a great tourism experience on your Jodhpur sightseeing tour, which you will cherish for lifetime.